Annual Meeting 2019 Save the Date and REGISTER NOW!! Four Seasons Resort Orlando at Walt Disney World® Resort-$309 per night! Make plans now to join your FLABOTA colleagues for fun and relaxation during the 22nd Annual FLABOTA Convention & Board Inauguration, Chapter Leadership Conference & CLE at the 5-Diamond Awarded Resort - Four Seasons Resort Orlando at Walt Disney World® Resort. The resort redefines luxury and fun in South Florida. The annual conference this year will feature a Chapter Leadership Program in addition to a half day CLE program. Other events will include the 2019 Board Inauguration, Chapter Leadership Conference, the Board of Directors business meeting and the annual award presentations for the 2019 Plaintiff Trial Lawyer of the Year Award, 2019 Jurist of the Year Award, 2019 Joseph P. Milton Professionalism and Civility Award and 2019 Fran Peacock Coker Community Service Award. Nestled in a secluded, residential setting within WALT DISNEY WORLD® Resort, a AAA Five Diamond Resort is a lakeside haven dotted with gardens, pools and towering pillars of palms and cypress. Tee off at the exclusive Four Seasons Golf and Sports Club Orlando. 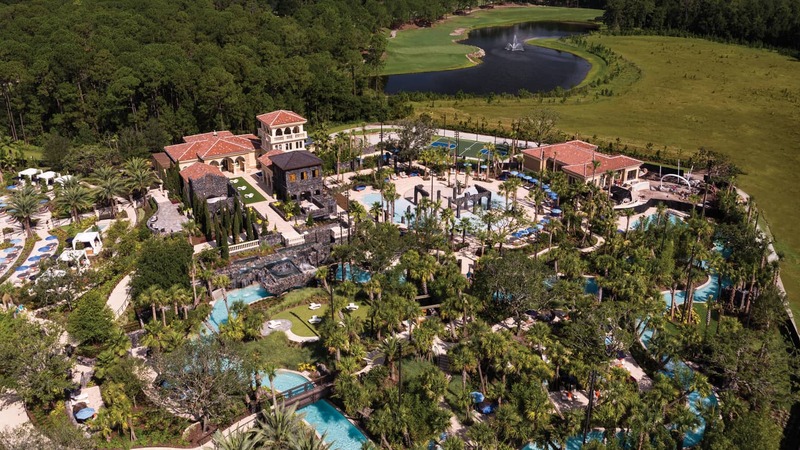 The Resort also features a $2.5 million dollar, 16-acre practice facility at Tranquilo, complete with undulating target greens, an 18-hole putting course and 6-hole Par 3 short course. With a perfect blend of Four Seasons experiences and Disney offerings, including access to EXTRA MAGIC HOURS benefit and DISNEY FASTPASS+up to 60 days prior to arrival as well as complimentary transportation to the Parks and in-room celebrations. Let's not forget the resort offers an on-site Good Morning Breakfast with Goofy & Pals character breakfast twice-weekly at Ravello. The buffet-style breakfast is offered on Thursdays and Saturdays (and select Tuesdays) and features a wonderful assortment of traditional breakfast favorites along with an omelette station. A photographer will be on-site to capture your memories with Goofy & Pals, the always-entertaining stars of the breakfast. Reservations are required for the character breakfast and can be made by contacting their on-site dining reservations team. Reservations are available from 7:30 am to 11:00 am. Magical moments are guaranteed. Additionally, your reservation will include complimentary access to Explorer Island where the fun never stops. Explorer Island is their five-acre water park which is a destination in its own right, with splash zones, interactive fountains, water slides and pools for kids and grown-ups alike. So splash around with the kids or grand kids at Explorer Island, treat yourself to a soothing, post-park massage at The Spa, or toast the evening fireworks with dinner at our rooftop steakhouse Capa. Experience unparalleled relaxation at Oasis, the chic adult-only pool, while the children have a blast at Kids For All Seasons, a complimentary program offered daily for kids ages 4 to 12. For reservations, you may click on the link above or call (407) 313-7777 and mention FLABOTA Convention. Rooms are greatly discounted at $309 per night and you may extend your stay at the group rate up to 3 days before. For additional information call Jacqueline Hart at 786-348-3766 or email her f[email protected]. See you there!! !